French President Nicolas Sarkozy was expected to reshuffle his Cabinet Tuesday following the governing conservative party's less-stellar-than-expected performance in legislative elections last weekend. French media suggested Finance Minister Jean-Louis Borloo would be a likely candidate to replace the government's de-facto deputy prime minister, Ecology Minister Alain Juppe. A prominent figure on the right, Juppe announced his resignation Sunday night after losing his parliamentary race. He was adhering to Prime Minister Francois Fillon's ruling that ministers - encouraged to run - would lose their Cabinet posts if they lost. Borloo has said he would not refuse an offer to replace Juppe. "For me, it would be a promotion," Borloo is quoted as saying in Tuesday's edition of Le Parisien daily. "For me, that's an offer that can't be refused." Le Parisien reported Agriculture Minister Christine Lagarde could replace Borloo at the Finance Ministry. An official announcement was expected later Tuesday. 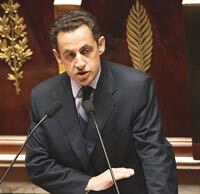 Sarkozy was also expected to add a half-dozen or so junior ministers to the government. He has promised to further reflect France's diversity with new posts for the opposition. Legislative elections last Sunday gave Sarkozy's conservatives and their allies a comfortable majority in the 577-seat National Assembly, with 345 seats. But that was fewer than the 359 seats Sarkozy's party had in the outgoing parliament and certainly not the "tsunami-sized" triumph predicted by pollsters.